... Most of the world’s oldest civilizations were born on the banks of some great river, but European civilization flourished thanks to the sea. It’s the Greek sea that the Romans enviously named Mare Nostrum. 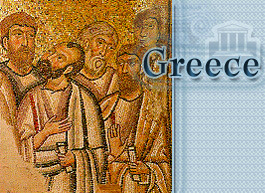 With the sea surrounding three parts of their country, the Greeks established contact with the people of Asia, Africa and the rest of Europe at a very early stage. Thus, they attempted distant journeys not merely to trade but also to see and learn and in short, were the first to engage in what we could call tourism. ... The Greek peninsula, covering an area of 131.944 square kilometers and containing a population of about 10.300.000 consists of mainland Greece (Attika, Peloponnese, Central Greece, Thessaly, Epirus, Macedonia, Thrace) and the islands. 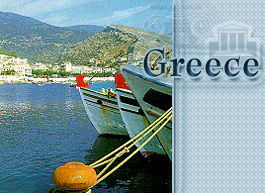 Geographically, Greece belongs to Europe since it forms the southern part of the Balkan peninsula but it also has a special link with Europe through the Ionian islands, Zakinthos, Ithaki, Corfu, Cephallonia, Kithira, lefkada and Paxi which form a chain off Greece’s western shores on the Ionian Sea. ... 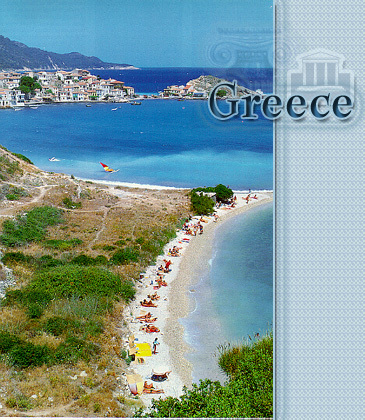 In contrast, there are the numerous islands of the Aegean Sea, some isolated like Kriti to the south, Ikaria, Hios and Lesvos to the East and Thassos and Samothrace to the North wile others form groups, such as the Cyclades, the Sporades and the Dodecanese. The largest are Kriti and Evia. The Cyclades consist of 39 islands, 24 of which are inhabited. The most important ones are Amorgos, Anafi, Andros, Milos, Mikonos, Naxos, Paros,, Santorini (also called Thira), Serifos, Sikinos, Sifnos, Siros, Tinos. Washed by sunshine and breathing the sea breeze their austere architecture on naked rock makes a unique match with the blue crystal clear water and the bright sky. ... The Sporades consist of Alonissos, Skiathos, Skopelos, and Skiros, lie off the eastern shores of mainland Greece and retain their genuine island characteristics and unchanged local traditions. 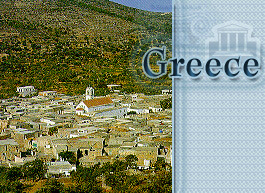 The Dodecanese group consists of twelve islands, Astipalea, Kalimnos, Karpathos, Kassos, Kastelorizo, Kos, Lipsos, Leros, Nissiros, Patmos, Rhodos, Simi, and a number of smaller islands each with its distinctive features and peculiarities. Finally, the Saronic Gulf between Attika and Peloponnese contains another group of small islands, Salamina, Aigina, Poros, Hydra and Spetses, all of which have played an important role throughout Greece’s History since the antiquity. Variety is the hallmark of the Greek geographical landscape. ... There are high mountains and mountain ranges such as Pindos, (also known as Greece’s backbone), Mount Olympus (with its snow-white summit, of Greece at an altitude of 2.917 meters) and the mountains of Crete, Peloponnese, Macedonia and Thrace. 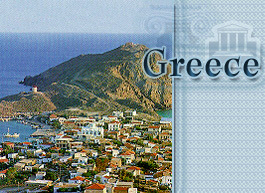 There are also canyons and gorges of unique magnificence and splendour, streams and rivers with crystal clear waters, soft hills and valleys with trees producing fruit famous for their taste and excellent nutritional value, since they ripe naturally under the Sun, which blesses Greece with warm and ample sunshine for an average of 3.000 hours per year. 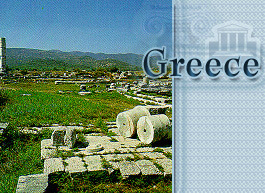 ... Countless vineyards produce juicy and tangling table grapes, excellent wines and cognacs and ouzo, a unique drink enjoyed by people world wide, as an appetizer as well as a main drink. 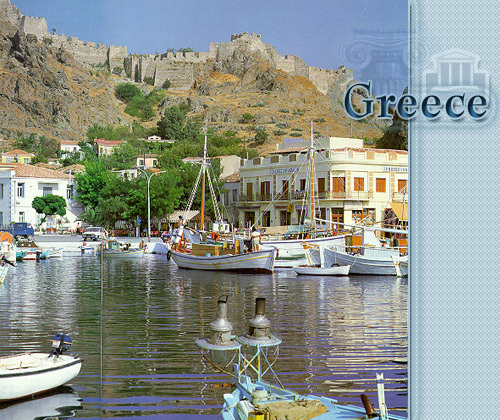 More than 15.000 Kms of unspoilt coastline and beaches of spectacular beauty and serenity strike the visitors. As a result, the Greeks lead an outdoor life, socializing rather than staying at home. 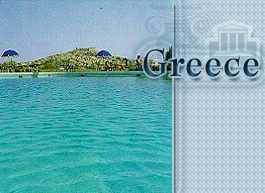 ... All year round, people in Greece can enjoy a variety of sports. Skiing on snow and water, climbing up steep mountains, canoeing or rafting downstream on challenging rivers, sailing in the blue seas, surfing , scuba diving or plain snorkeling fishing, swimming or…. just lying carefree under the glorious sun are only some of the many sports a visitor can enjoy. 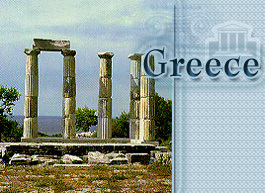 Prices in Greece are very reasonable compared to the European countries, so you can make your ‘’dream holiday’’ come true whether you are very rich, just rich or ...not that rich! Please click on a thumbnail for a larger version of the image.